Nammalvar has offered mangalaashaasanam in 11 songs in his Tiruvaymoli. The ‘Garuda Sevai’ festival during the month of Vaikasi is famous and well-attended. Nammalvar is taken in procession on ‘hamsa vahanam’ (Swan-carriage) on his birthday, that is, the day with Visaka star. 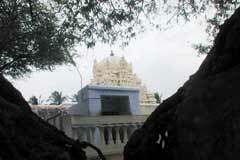 This is one of the 108 sacred places of Lord Vishnu and the 5th Navathiruppathi dedicated to ‘Guru’ or Jupiter. The Temple is open from morning 7.30 to 12.00 noon and from 5.00 pm to 8.00 pm. The Prime Deity Aathippiraan faces east in standing posture. The image is a swayambu (manifested) and is believed that the feet of the Prime Deity are under the earth. 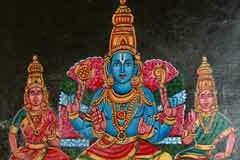 The Lords Spouses, Aathinathanayaki and Thirukkurukoornayaki dwell in separate shrines. 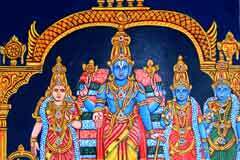 This place is also known as Thirukkurukoor because (i) once Lord Brahma received mantropadesam (teaching of mantra) from Lord Vishnu in appreciation of his tapasaya .Since the Lord became Guru, the place was called kurukoor. (ii) Nammalvars ancestor, a chieftain by name Kurukan had this place as his capitol; hence the name kurukoor. (iii) The Tamil word kuruku means stork, hen and conch . 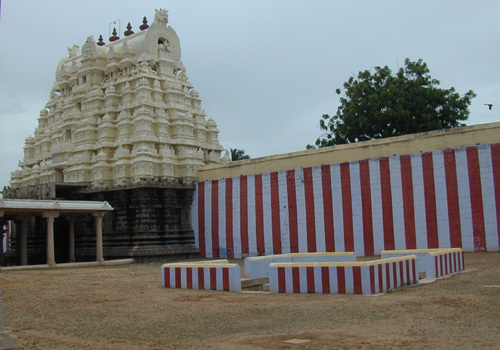 The conch or kuruku attained moksha in this place and so the name kurukoor. 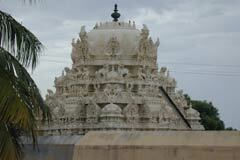 Nammalvars shrine is more famous than the Lords and so the city came to be known as Alwarthirunagari. Kambar in his work Satagoparanthaathi uses the name kurukoor only. This sacred place is also known as Dhantha Kshetram, Varaha Kshetram, Thirtha Kshetram and Sesha Kshetram, each one has a legend of its own to gain such an identity. All afflictions that happen due to the Navagraha curse, will be alleviated by worshipping the deities at Navatiruppatis. 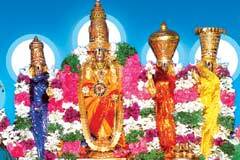 Devotees perform thirumanjanam for the Lord and don him with new clothes. Those devotees whose prayers are fulfilled give as offering anything they desire. 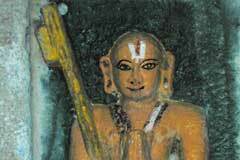 The nine Vaishnava holy places are considered as related to the Navagrahas (Nine Planets) and worshipped. The deities themselves are taken to be the Navagrahas and prayed. To a Vaishnavite, the term ‘Alvar’ signifies Nammalvar who has rendered in Tamil Thiruvaaymoli, considered to be the essence of Vedas. He had not visited any divyadesam and remaining in the tree-hole, he sang of all the deities in the different divyadesams. 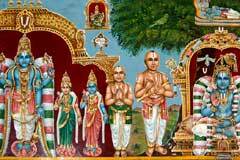 It is believed that all these deities rushed to Kurukoor, sat in the branches of the tamarind tree and requested Nammalvar to hail them! Madhurakavi Alvar, born in Thirukkolur (Navathiruppathi for Mars), saw a blazing light from the south when he was journeying in the north, came to Kurukkor following the light. He saw Nammalvar sitting in Yoga in the tree-hole, understood that he was his Guru and declared in his 11 pacurams, commencing with the phrase “kanninun cirutthaambu” that there cannot be a God other than Kurukoor Nambi (Nammalvar). He then compiled the Thiruvaaymoli. 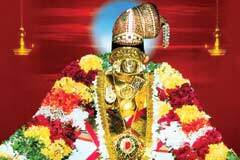 Nammalvar alone has consecrated this deity in 11 pacurams. Miracle Based: This is one of the 108 sacred places of Lord Vishnu and the 5th Navathiruppathi dedicated to ‘Guru’ or Jupiter. 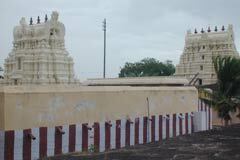 Alwarthirunagari is in the Tirunelveli-Tiruchendur railway route and the temple is about 1.5 kms from the station. It is about 5kms from Srivaikuntam and 34 kms from Tirunelveli, from where frequent bus services are available.